Patrons no longer have to experience the smells and unsightliness of your employees emptying the trash bins during their visit. Exchanging the bags can be done at your convenience using our roll-out / roll –in, easy exchange system. The waste deposit door opens and closes automatically so Customers no longer have to touch the door with their hands. Customers are more motivated to clear their tables just to see the unit Work for Them. 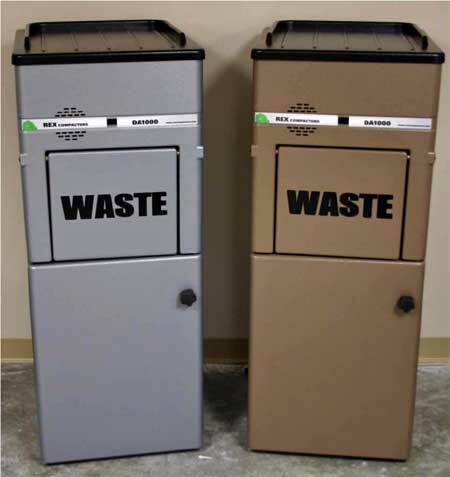 Frees up dining area space to allow for more dine-in guests (1 TCG-DA 1000 can replace the trash volume requirements of many traditional trash bins while also emptying each unit much less. Labor and Haulage costs are greatly reduced. Eliminates unsightly, overflowing trash receptacle. Positive interaction between Patrons and Compacting Unit increasing Patrons use. Potential for Customer Beneficial promotional messages. 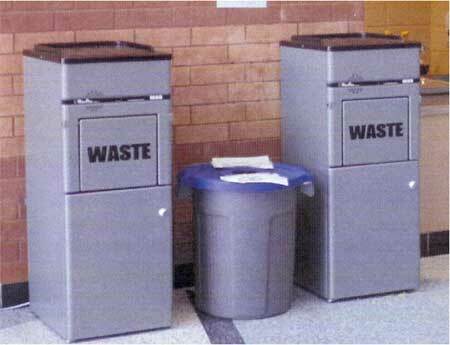 Patrons no longer have to experience the unpleasant smells & unsightliness of employees constantly emptying the trash bins. 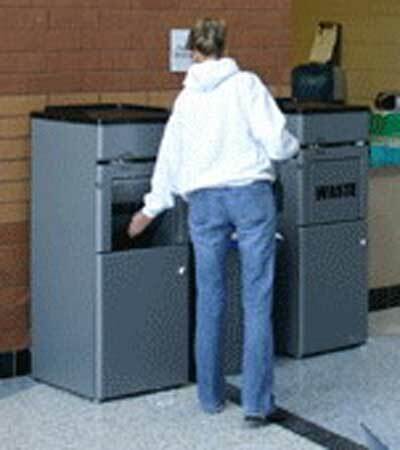 Eliminates bags of trash accumulating in the plastic carts or hallways, waiting to be taken to the disposal area. This reduces fire hazards and unsanitary conditions. Unit can be adjusted to compact from 20 to 50 lbs this eliminates the need for any additional lifting device. Receiving cube has a telescoping handle and wheels built right into it. Simply extend the handle and easily roll it to the trash bin. 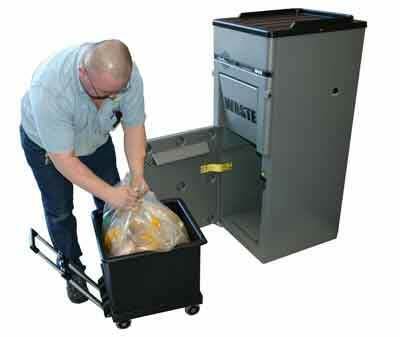 When a Customer approaches the compactor, the waste door opens. The motion sensor is set at the factory to open the door at approximately 2 feet when approached. This function is adjustable based on each settings requirements. The door closes when the customer moves away from the machine. This is considered as one single door opening cycle. The door will also open if you approach the compactor from the side by just touching the door. This can be done by not walking in front of the motion sensor. After seven door cycles, the compactor automatically locks the door and the unit then goes through the compaction cycle. Overall footprint of the compactor is 20" wide by 23" deep. Unit comes in choice of 3 colors. Door opens automatically, sanitary and safe. Customers like using the unit. Low power requirement. Standard wall outlet is all that is required. Up to a 10:1 compaction ratio. Indicator light on the front of the machine will advise as to the status of the machine. Blinking light will indicate compactor in operation. Solid light will indicate that the compactor is full. Compaction force can be adjusted up or down depending on the preferred weight of the cube. Range is from 15 to 60 lbs. Cube lifter is available for fully compacted cubes, no heavy lifting required. No touch door sensor, as person approaches the machine the door will automatically open. Removable waste bin on included trolley for easy and quick liner replacement. Full one year parts and labor warranty on components and five year limited warranty on cabinet from date of receiving from factory, exclusive of labor, except as expressly assumed by manufacturer in writing. Warranty will cover all component parts of the TCG-1000 compactor. All defective parts must be returned to factory, freight prepaid, upon receipt of written return authorization. Should the Model TCG - 1000 compactor not operate to written specifications within 90 days, Compaction Plus will accept return of the equipment and refund all monies received. Our Customers are experiencing an 18 month payback. Rental Programs & Lease to Own Options are available. Note: Shipping will be invoiced extra FOB factory. Please call 905-878-3400 for further details or to arrange an onsite meeting.